A grieving woman is abducted by a champion racing driver turned serial killer—and it may be the answer to her prayers for his salvation. Can Ruth trust God to work good, even if it costs her life? Despite her husband’s objections, 40-something Ruth Warner finds healing through prayer for Harry Silver, the former race car driver who brutally raped and murdered her niece. When a kidnapping-gone-wrong pegs her as his next victim, Harry claims that by destroying the one person who’d pray for him, he proves God can’t—or won’t—look after His own. Can Ruth’s faith sustain her to the end—whatever the cost? Heaven’s Prey is about a dangerous offender’s last chance at redemption and a vulnerable woman’s obedience to pray for her enemy—not the gentle inspirational read many associate with Christian fiction. The first edition of this novel was a finalist in the 2013 Word Awards (suspense category). If you like issue-driven, faith-filled Christian suspense and you believe in the power of prayer and forgiveness, grab your copy of Heaven’s Prey today. Ruth Warner: abducted by the serial killer she’s been praying for. Tony Warner: the guy whose wife gets abducted. The supporting cast: others affected by the story. And read the prologue (not in the novel): Heaven’s Prey prologue. 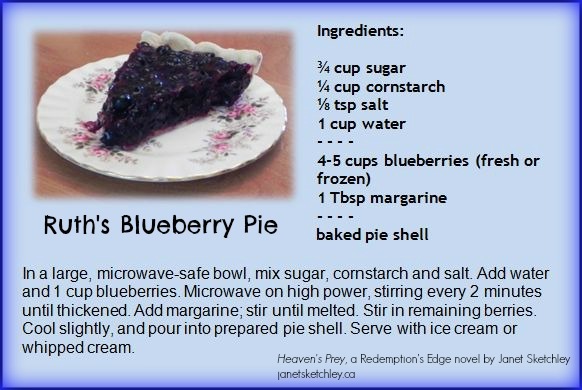 Bonus feature: Ruth’s blueberry pie recipe. Find Heaven’s Prey online: Goodreads, Shelfari, Pinterest. "Readers are safe in the hands of this skillful writer as Janet Sketchley leads them, and her characters, through the heart of darkness and into the Light. A powerful debut novel." "Heaven's Prey tells a story of intense emotion and trial. It pulls in elements of life that are hard and can't always be explained. Yet, it offers the one thing that the world desperately needs to face those trials—a hope in a God who carries us through. This story is fast-paced, heart pounding and inspiring." – Donna Fawcett, award winning author of Vengeance and Rescued, author of Duke the Chihuahua Writes!